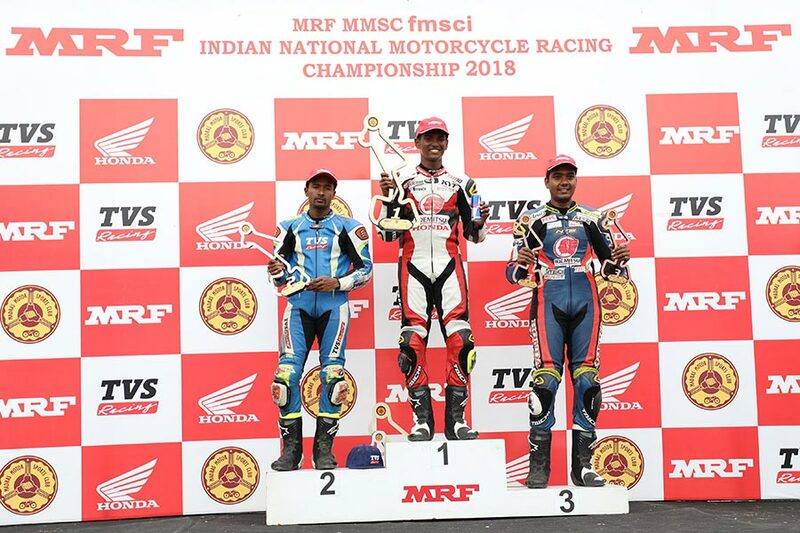 The second round of Indian National Motorcycle Racing Championship 2018 (INMRC) saw TVS Racing’s defending champion Jagan Kumar bag the second place in Super Sport 165 Group B category. Jagan was on pole position after qualifying on Friday but finished in P2 in both the races over the weekend. TVS Racing’s Deepak Ravikumar finished the race at the fourth place in Race 2 while team-mate KY Ahamed suffered unfortunate crashes in both the races. This was a difficult round for the team as our defending champion, Jagan was leading for a large part of the race but unfortunately could not capitalize this for a win. Ahamed was unlucky with the crash but I am quite impressed with Deepak’s consistent performance. We have learnt a lot from the races and I am confident the team will bounce back in the next round. In the recently introduced TVS One Make Championship RR 310, Vivek Pillai took the lead followed by Deepak Ravikumar at P2 and Yashas RL at P3. The TVS Young Media Racer Program, in its second edition, saw Shahnawaz Karim (Wheelsguru) finish on top followed by Gavin Rodrigues (Motorbeam) at P2 and Stephen Neil (Drive Spark) at P3. Nikhil Thorvat from GaadiKey finished P5 in TVS Young Media Racer Program. The next round of INMRC will be held at MMRT, Chennai from August 03 – 05, 2018.